During the half score and a few years that we have been actively travelling, we haven't met a traveller who hasn't asked us if haven't seen "it" as soon as (s)he confirms what our looks tell about our country of origin. Things had gotten so bad now that we just reply "No, we have not seen it" whenever anyone asks us where we are from. This Taj sized hole in our travel resume had to be plugged soon and that was our primary aim when our post-monsoon travel season resumed in 2012. But it had to wait a bit as we decided to start our trip from Delhi as it is a bit easier to reach from Pune. 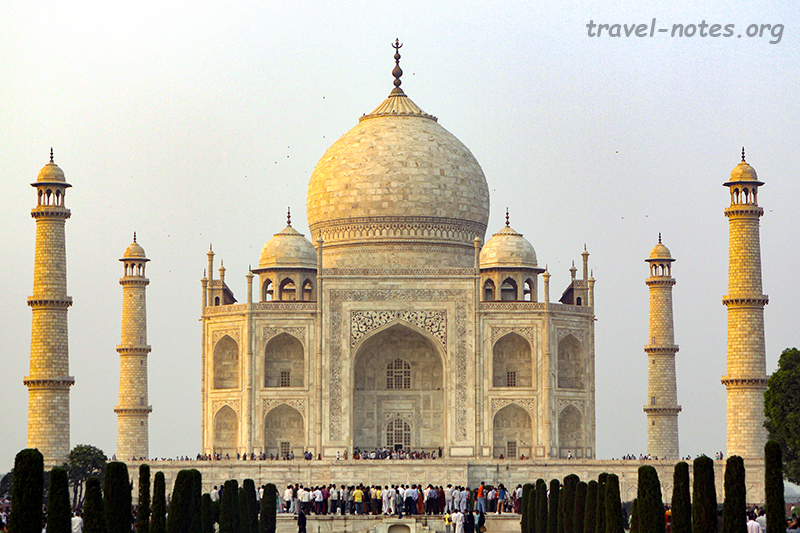 Delhi to Agra is chock a block of travelling must-sees that it took us a few days in getting to our final destination. Given that we had beaten Delhi (or rather whatever life is left in it after modern congestion) to death little over an year ago, we made a beeline to our first destination, Alwar, as soon as our train would let us get off our seats. This resulted in us taking a four hour taxi ride right on the heels of a day long train ride, something that we don't plan to repeat until we all start suffering from collective amnesia. 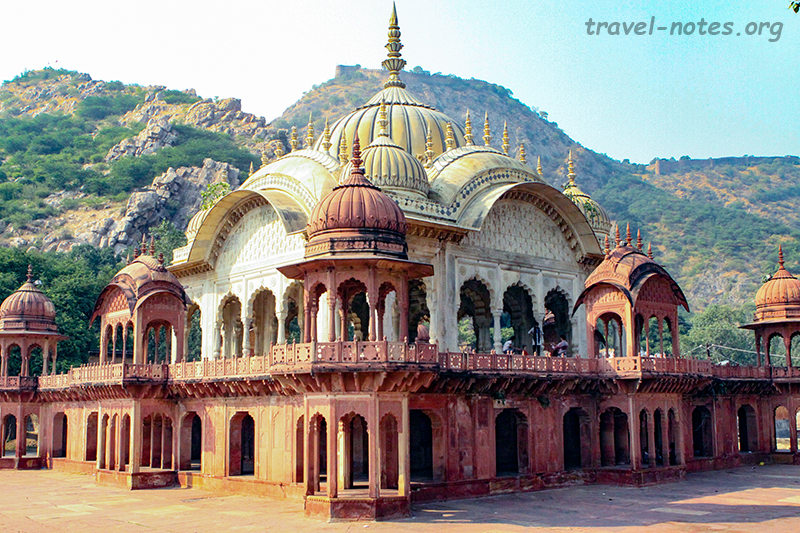 The princely state of Alwar mushroomed up during the infancy of British influence in Indian history. This was the first state to ally itself with the British and gave them the idea that India can be captured one verbose treaty at a time. The shadow of British military helped to keep the Jats at bay and the state got a semblance of stability, enough to dabble in art and architecture. The City Palace is quite impressive enough, but the icing on the cake is the beautiful cenotaph of its second ruler Maharaja Bakhtawar Singh. Surrounded by the Aravallis on three sides and overlooked by a 9th century Rajput fort, this cenotaph with its adjacent royal pond is set in the most picturesque of locations imaginable. Despite a drunk guard insisting on guiding us despite his lack of historical knowledge, the place really made up for the effort it took us to reach here. The following morning we took a car to Deeg, one of the lesser visited historical gems of the country. On the hindsight we could have gone green and hired a bullock cart instead. The pot holed ridden route ensured that we covered the 70km distance at a bovine pace of 3 hours. All this effort was to get to the best preserved and one of the most impressive palace complexes of the nation. Jats of Bharatpur were the most powerful kingdom of North India in the mid 18th century. Its most famous ruler, Suraj Mal, successfully attacked Mughal strongholds of Delhi and Agra which provided him enough wealth to build a sumptuous summer palace at Deeg. The palace boasts of a thousand working fountains which, in its glory days, spewed coloured water for the enjoyment of the royalty. The main royal residence, Gopal Bhavan, overlooking the royal pond still contains the original furnishings and is as impressive to look from the inside as it is from the outside. After spending a couple of hours in its impressive open space, we dragged ourselves back into our car to reach the final destination for the day - Mathura. Mathura, a typical congested temple city of India, is famous because it is the birthplace of one of the most celebrated gods of Hinduism's - Krishna. God surely works in mysterious ways, nothing else can explain why an omnipotent entity would decide to be born here instead of choosing a private island in South Pacific. The Mathura school of Art, one of the nation's pride posessions, flourished here between 3rd century BC and 12th century AD. This was the first school to blend indigenous art forms with foreign (predominantly Greek) influence. Since the long taxi ride ate into our rest time, we had to hit the road as soon as we reached Mathura. We started off visiting the city's Archaeological Museum which houses some impressive examples of the above mentioned school of art. Mathura, set on the banks on Yamuna, is a mini-Varanasi with the Ghats lining the river's edge. After two days of non-stop sightseeing, Pranav decided to launch a mutiny and we had to strike a compromise that resulted in us not entering any of the over-crowded Ghats but to "tour" them from distance - from the comfort of a private boat floating down the Yamuna. 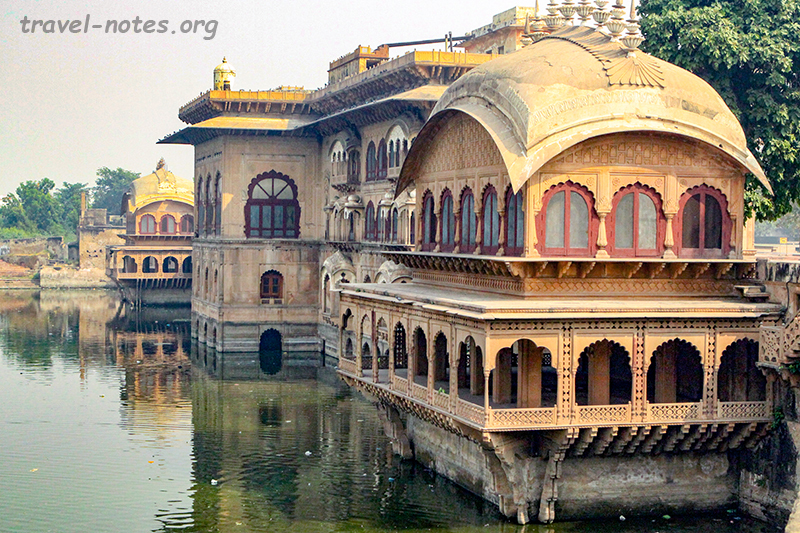 Unlike other temple towns, Mathura has a twin sister - Vrindavan. It is here that Krishna grew up as Mathura became too dangerous to live even for a god. The twin temple towns boasts about a billion temples and after an extensive two month research I had short listed this to about half a dozen. The auto-rickshaw person we hired the following morning, took one look at the list, had a mighty laugh and tore it to pieces and took us to his favourite five instead - the fairy tale castle look alike Pagal Baba Temple, the glittering mirror filled Krishna Temple, the ubiquitous ISKCON temple, the brand spanking new Prema Mandir (built along the lines of Akshardham) and the heavily barricaded Krishna's birthplace temple. At the end of the day, this turned out to be quite a satisfactory set. Once the temple hopping ended, we took an early afternoon taxi and finally reached Agra. It was too late in the day (read: too crowded) to rush to Taj. So we decided to get to Mehtab Bagh, a garden that pre-dates Taj and is located right behind Taj across the Yamuna - a perfect place to watch sun set on the Taj without being mobbed by million human beings. The perfect place to watch the sun rise is the actual Taj complex itself and that is where we were at the crack of the following dawn. People much more talented than me (with Nobel, Pulitzers and what not under their belt) had tried and failed to capture Taj's beauty in words. So I will chicken out and just stick to the mundane - history and logistics. The established theory is that the Taj was built by the grieving Shah Jahan for his favourite wife Mumtaz - a theory that I am skeptical about. For one, Shah Jehan married twice when Mumtaz was alive and secondly, she died giving birth to their fourteenth child - i.e. she was effectively sentenced to dozen odd years of hard labour; must be some love, innit? Moving onto logistics, when we reached Taj at 6 in the morning, the "foreigner queue" was a kilometer long from the entrance (that is after circling the planet a couple of times) and the Indian line had one grumpy looking person in front of us (who later turned out to be the ticket collector). So if you had just returned from the US after without taking its citizenship despite spending more than a decade there, just visit Taj to pep up your sagging spirit. The government of UP is hell scared of someone stealing the Taj under their nose and has hence surrounded it by stifling security. Everyone gets a full body pat-down by a person of the same gender. Men get groped in public and the women get it in private. Hopefully, this information helps you to make up your mind on the gender change procedure that you have been putting off for a while now. 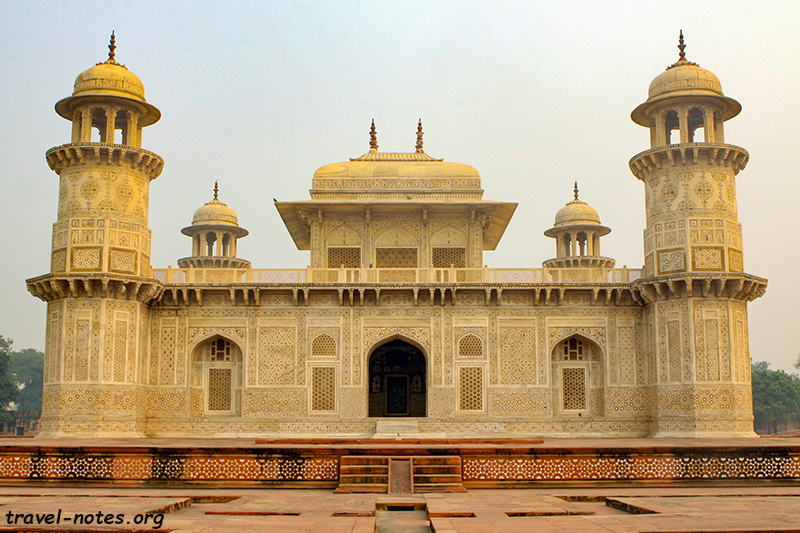 Agra also boasts Mughal's (and the nation's) finest fort. This was the primary residence of the Mughal emperors for over five generations - i.e. the people who built the Taj and like actually lived here. So the fort is a great blend of aesthetics and military might. Almost everyone who visits Taj makes it to the fort; but hardly anyone visits the lesser known gems: Itimad-ud-Daula, the first marble mausoleum of Agra built by Noor Jehan for her father, Chini-ka-Rauza, the Persian tile adorned mausoleum of Shah Jehan’s Chief Minister and Akbar's mausoleum, a grand edifice befitting the greatest of the Mughal rulers. Since I had budgeted three days at Agra to give us every chance to beat the elements, we had plenty of time to kill at all these monuments. If you end up getting "ruined-out" by Agra, nature can come to your rescue. An hour and a half from Agra is Bharatpur, nation's most celebrated bird sanctuary hosting hoards of migratory birds during the winter. Unfortunately, the route to Bharatpur takes you perilously close to Fatehpur-Sikri, another Mughal masterpiece and that is something you must endure. Akbar's patron saint lived here and Akbar had managed to delude himself that his son Jahangir was born only after being blessed by the saint. So when the saint passed away, Akbar built a marble tomb and moved his capital here from Delhi. The palace complex houses three palaces, one for each of Akbar's wives, a pond with a platform in the middle where Tansen (one of history's celebrated musicians) worked his magic under the moonlight, an impressive five storied Panch Mahal, a Diwan-E-Aam (Hall of Private Audience) with a central octagonal tower designed to take your breath away. The icing on the cake is the grand Buland Darwaza, the 54m tall gateway to the Mosque, built to commemorate Akbar's victory in Gujarat. The only thing the entire new city lacked was water and since Akbar couldn't figure out how to run a city without it, he reluctantly moved his capital to Agra. After paying the customary homage to the ruins and the dargah of Salim Chisti, we made it to Bharatpur with enough time to give us a couple of safaris - we need at least two to ensure that Pranav does not get on any and the rest can get on at least one. The best time to visit here is at the end of the season (Jan-Feb) when all the migratory birds would have arrived. But November wasn't bad either and we got to spot at least one each of the celebrated bird species. The park boasts of unique cycle-rickshaw safari where the rickshaw pullers double up as excellent bird spotters and guide. Enjoying the scenery from the silence of a rickshaw (instead of a dust spewing jeep), listening to the cacophony of millions of breeding Painted Storks, getting to see the Sarus Cranes, the iconic bird of the park would have been a great way to end our trip. But unfortunately a trip always ends with the return journey, which for us was a painfully long train ride on side berths (you need to travel by the Indian rail to realise what a pain this is) without home cooked food to comfort you. But at least we had the satisfaction of finally earning the respect of a fellow traveller and can declare boldly of having being there and having done that! Click here for more photos from Alwar and Deeg. Click here for more photos from Mathura and Vrindavan. Click here for more photos from Agra. 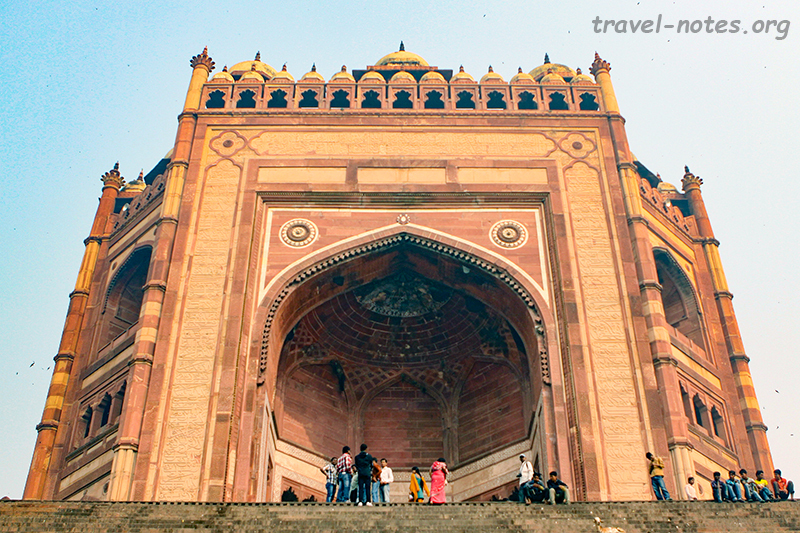 Click here for more photos from Fatehpur Sikri. 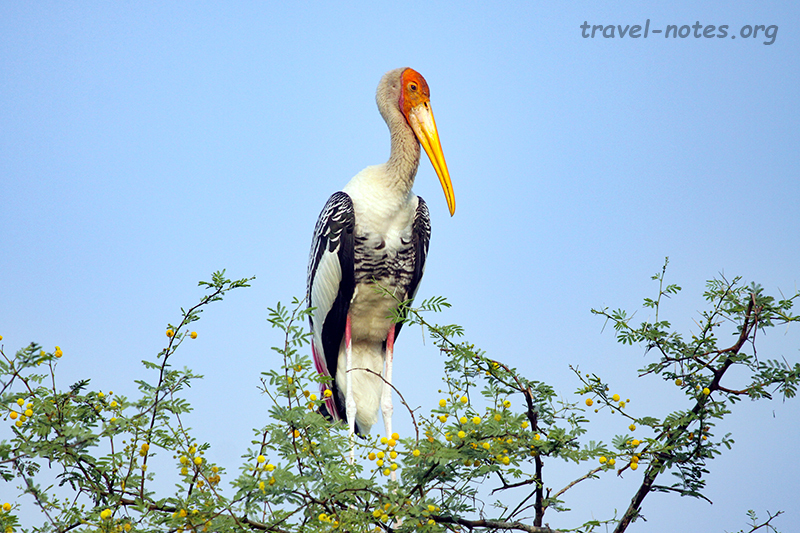 Click here for more photos from Keoladeo National Park, Bharatpur.